Writing and recording songs has never been as easy as today – all you have to do is simply get an audio interface and you’re almost halfway done. USB interfaces, in particular, have significantly simplified the entire process, and it’s no wonder people are looking for the best model for the buck. Steinberg’s UR22 earned quite a fame among music producers due to user-friendly features and excellent performance, but let’s not forget Focusrite’s Scarlett and Clarett series interface models – the fact is that these brands are giants in the music industry world, and we’re here to compare their flagship models – the UR22 from Steinberg, and Scarlett 2i2 from Focusrite. Steinberg’s UR22 is an improvement of UR12 – the latter is a 24-bit USB audio interface which operates at 192 kHz and features a Class-A mic pre-amp with 48 watts of phantom power. Now, the reason why Steinberg decided to upgrade to something more serious is that the earlier version (UR12) had only so much to offer. It’s a plain audio interface with only a handful of features which will do the job just right, but you won’t be able to squeeze perfection out of it. The UR22, on the other hand, features two USB ports and it’s compatible with most major editing and mastering software programs. Just like its predecessor, it’s a 24-bit interface with a Class-A mic preamp which works at 192 kHz, so the original concept remains. UR22 promises more versatility since it features two mic/line ports (as opposed to UR12’s one), two input gain knobs, phones knob, mix, and output controls. Though pretty basic overall, the UR22 works like a charm for medium-level processing, mastering, and editing whereas its predecessor was mainly favored by beginners and people who don’t make a living from music editing. Steinberg’s trademark Cubase software is included in AI and LE editions along with a comprehensive user manual which contains all the details you need to understand how these work. Focusrite’s Scarlet 2i2 is truly a work of art. It’s a beautiful USB audio interface which is only different from its predecessor (and later versions) in terms of size and versatility. The Scarlett 2i2 follows the same concept Scarlett Solo laid out – there are several improvements, but nothing too major. First of all, there are two mic ports, a monitor knob, two gain control knobs (with different colors for easier differentiation), two-line sliders, and a direct monitor indicator. Just like Steinberg’s UR22, this audio interface unit is heavily oriented around user-friendly features. It’s very easy to use it, and even the most immediate beginners should get a good grip on the basics in just a day or two. Let’s delve deeper into details. There are 4 analog inputs – 2 natural-sounding mic preamps (buffed with plenty of gain) and two additional instrument inputs. The first similarity between UR22 and 2i2 is that they both operate at 24bit/192 kHz. The latency is incredibly low, measured at approximately 2.74 ms, so it’s safe to say that this is one serious entry-level interface. You’ll get Pro Tools, Focusrite Creative Pack 1, Ableton Live Lite and Softube Time (as well as Red Plug-in Suite) with the package, which is pretty awesome. Even though the design of your interface isn’t too important in terms of aesthetics, it can give us a clear picture of whether it’s easy to use it or not. Both UR22 and 2i2 are labeled as “user-friendly” due to their plain design, so we’ll mainly talk about which one is simpler. Steinberg’s UR22 appears somewhat disorganized when compared to 2i2 – the mic/line inputs are pretty close together, but their corresponding inputs are found at the sides. It might have been easier if they were directly below, but that’s not too big of a deal. The control knobs (mix, phones, output) are in the top right corner, but the Hi-Z input looks like it was placed there at random. The 2i2, on the other hand, looks pretty convenient – it’s as if it was divided in two, where the gains and line controls were directly linked to their port. The only problem is that gain knobs emit super-bright lights, so this round goes to UR22. 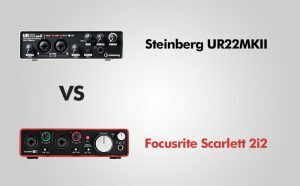 Basically, Steinberg’s UR22 offers very little versatility while Focusrite Scarlett 2i2 promises quite a lot in this field. Both of these interface units work at 24-bit/192 kHz and are outfitted with major hardware features and technologies – low latency, low distortion, and premium-quality sound is guaranteed. The only thing that separates the two are software platforms you’ll use them with – Steinberg’s UR22 comes with Cubase AI and LE while 2i2 comes with a plethora of software programs, emerging victorious in this round. This is, perhaps, the most important part of our evaluation – people don’t want to overpay their interface units, but on the other hand, low-cost units don’t appear too promising. Sadly, if you were dubious about which one’s better and wanted to pass on the final verdict based on the price, we have bad news – both of these audio interface units belong to the same price point category, so this one’s a draw. So, let’s summarize – Steinberg’s UR22 is a solid, plain-looking interface unit with a mediocre level of versatility, but it compromises for it with excellent performance. Even though 2i2 isn’t lacking in this department, the flashy lights make it a bit less user-friendly. Although both of these audio interface units boast superb performance, Scarlett 2i2 comes with better downloadable software. The price isn’t the issue since they cost pretty much the same, but we can’t simply say that these two models are a perfect match – 2i2 looks better, features better software, and if you can look past the little flashy flaw, it would appear as if it wins this bout.